As part of its 50th Anniversary Lectureships scheme, Lancaster University is looking to make several new appointments to its Data Science Institute. Four positions are aimed at applied data science, such as the environment, which could include working with atmospheric and climate models and observations. General details of the scheme are available at: http://www.aplacetoblossom.co.uk. The aim is to appoint early career scientists with encouragement as a cohort to develop rapidly towards rapid promotion and leadership. Excellence and potential are more important than subject area, so if you working within “Big Data” or related areas then you are strongly encouraged to apply. What are the big ecological ideas and discoveries of the last century? In December 2015, the Ecological Society of America will celebrate a big birthday: 100 years since the first group of botanists and zoologists, parasitologists, geologists, physiologists, and marine biologists gathered in Columbus, Ohio, to unite their shared interest in the relationships of the great diversity of living organisms to each other and their surroundings. To kick off our centennial year, we are asking ecologists to tell us about the ideas and discoveries that have had the biggest influence on the field over the last century – and why. A few folks have taken up the question on their blogs, arguing for concepts, tools, or events as diverse as food webs, quantification of natural selection, advent of biological field stations, trophic cascades, the modern synthesis, systems ecology, succession, the development of statistical standards of evidence, and the conservation movement of the mid-twentieth century. Others are discussing the question on twitter under hashtag #ESA100. What’s your pick for the biggest milestones in ecology of the last 100 years? What is sustainability? Why sust-AINA-bility? Is there a point of no return? Are we doing enough? Come with questions and open heart to listen to real people share their sustainability stories on pathways of food sovereignty, energy independence, and zero-waste consumption. This event is open to the public. Keiki are welcomed. When a scientist picks up a camera: An interview with Andrew Snyder…. I would like to draw your attention to my recently launched crowd-funding campaign to find foraging areas of nesting loggerheads using trace elements https://www.instrumentl.com/campaigns/melanialopez/ <https://www.instrumentl.com/campaigns/melanialopez/> . The campaign is being supported by INSTRUMENTL (https://www.instrumentl.com/), a recent web platform that funds women in STEM. They are focusing on projects with small budgets, up to $5,000 dollars and dedicate their time an effort to one campaign at a time. This is a great and alternative way to obtain funding for graduate students and young scientists as well as a good opportunity to get the public interested in scientific research. If you can help me disseminate this information, I will truly appreciate it. Melania C. López Castro, Ph.D.
Asia-Pacific Wastewater Treatment & Reuse Conference 2015 – Abstract Submission Closing Soon! Wastewater management and water reuse have become increasingly important due to rapid population growth, industrialization and the on-going water crisis in certain areas of the Asia-Pacific region. Against this backdrop, this Conference serves as an important platform to gather water professionals from all over the world to share technical expertise and solutions in wastewater management and water reuse; and to foster potential international cooperation. It will allow for the exchange of views and experiences on best practices and innovative technologies amongst relevant policymakers, operational experts and researchers from governments, international organizations, institutions and industry. Selected submissions may be offered expedited review and early publication in the Water Environment Federation journal, Water Environment Research. This provides a rare opportunity for publication of research in a well-known and respected peer-reviewed journal. This Conference is jointly organised by the Environmental Engineering Society of Singapore, the Water Environmental Federation and Centre for Water Research, and supported by PUB, the National University of Singapore and the Singapore Exhibition and Convention Bureau. Tomorrow, Thursday 10/23 at 11am MDT, 1pm EDT, sign in to Twitter to join in the conversation about the Greenland Ice Sheet, climate change and sea level rise with Los Alamos National Lab’s Ice Sheet Modeling Team. The first direct observations of multiple components of the plumbing system beneath the Greenland Ice Sheet and how it relates to ice flow. How the team identified when a clear climate change signal in Greenland surface conditions, due to human influence, should emerge from natural variability. The modeling of sea level rise from Greenland melting over next 200 years: ~3 inches but unresolved processes could increase this number. Why reversing the climate will not stop sea level rise – Most of sea level rise from ice sheets is “committed” long before it happens. And the upcoming public release of two new ice sheet models from the LANL Ice Sheet Team. 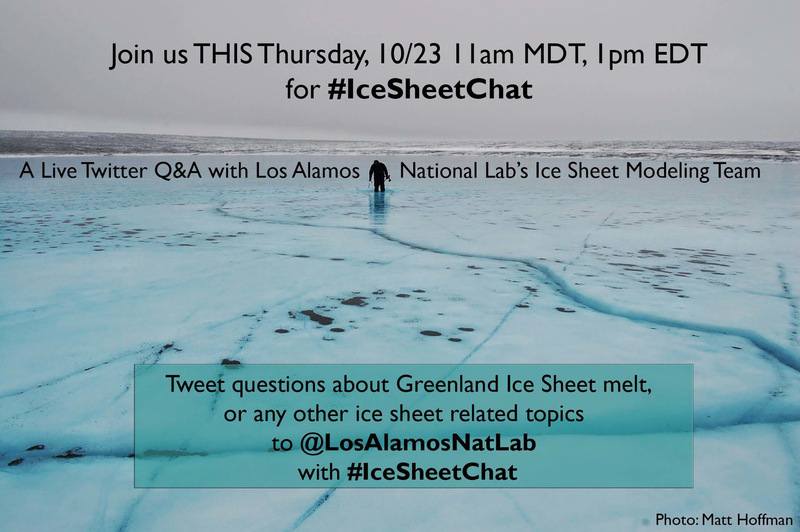 Tweet your questions, comments or thoughts to @LosAlamosNatLab using #IceSheetChat. Click here <http://1.usa.gov/1vJfatU> to read more about the how new models are helping advance our understanding of the Greenland Ice Sheet’s meltwater channels. 30 Creative Ways to Use Less Plastic and Go Green!